March is typically filled with a variety of different types of weather. Last week we had a few days that were freezing (freezing for Northern California that is...) and today it was in the high 70s. My son is fascinated by the weather, so we are excited to be joining Nurturestore's Weather Blog Hop (along with several other bloggers listed below)! You'll find loads of weather-related crafts, activities, and other sorts of projects in the linky further down this post. Today we are sharing about our weather themed Mommy and Me Book club hosted by my creative friend Chrissie. For our gathering activity, she hid several weather-themed paper symbols around the room (lightning bolt, cloud, raindrop, etc) and the kids had to hunt for the one with their name on it. Then she read What Will the Weather By Like Today? by Paul Rogers while the kids sat on "clouds" (fluffy pillows). 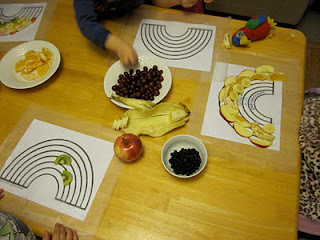 The book ends with a rainbow, so we went over to the table after we read and created fruit rainbows for our snack. 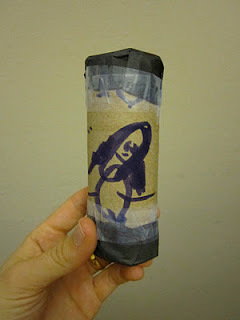 We ended the day by making rainsticks out of toilet paper rolls and then we sang our goodbye song. Didn't my friend Chrissie plan such a wonderful morning for the kids? 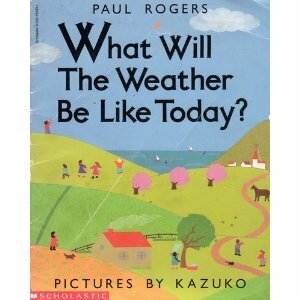 Do you have any other favorite weather-themed books that you like to read with your kids? 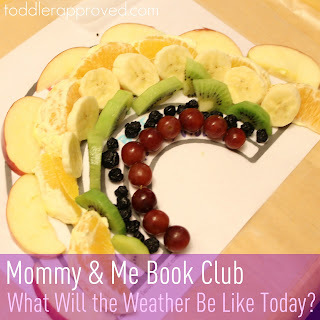 If you like the idea of a Mommy and Me Book Club, make sure to check out our upcoming Virtual Book Club for Kids! You are all invited to join us! If you're looking for some other fun weather-themed ideas, click on the links below or add your own great ideas. I can't wait to see all the fabulous ones that are shared! I would love for Ben and I to participate in mommy and me book club if you guys are taking on any new members? : ) let me know. Ahhh! !1 like the snacks you did make.